Fire Suppression System Solution Saves Costs with Kerr Pump’s Innovative Tank and Pumps Design. Kerr Pump & Supply had recently spent time sizing industrial pumps for a local engineer for a new brake components manufacturing facility. 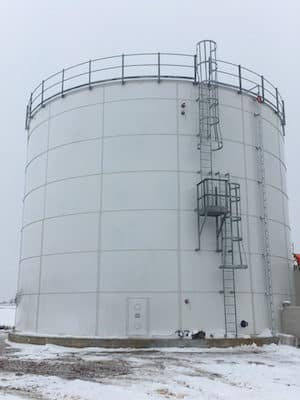 Due to a limited budget, and a strong pump selection required for fire suppression, we found cost savings by using alternate measures on the storage tank. Kerr Pump suggested bolted tank construction to reduce cost, avoid factory installation, and still hold the required volume per the facilities design. The solution was to construct a 320,000 gallon bolted storage tank. This is a massive storage tank that has a sloped roof without center columns, supported with a standard deck structure with a flat steel floor. It is one of the biggest tanks that Kerr Pump has constructed. Aurora fire pumps and accessories were installed in the building adjacent to the storage tank. The completed Fire Suppression System project was a big success for both owner and installer. Kerr Pump always strives for success and satisfaction from both installer and end user. At the end of the day, this customer satisfaction level will lead to long term, mutually beneficial future projects for all involved. Contact us today to find a solution for your next project.